Have you ever failed? What did you learn from it? What did you hate but now like? Want more? Check out 650 Prompts for Personal Writing. Let’s not forget our favorite biographies and autobiographies! Don’t want to write about you? No problem! Read someone else’s story. I’ll admit that I don’t read tons of biographies, but I do have something up my sleeve for a recommendation. I’m going to suggest The Boys on the Boat – the young readers adaptation. Technically it is the story of how the U.S. won the 1936 Olympic gold medal in mens eight oar crew. I know that on the surface that doesn’t sound too exciting. Just trust me on this one. This story pulls at your heart in more ways than one while keeping you on the edge of your seat. 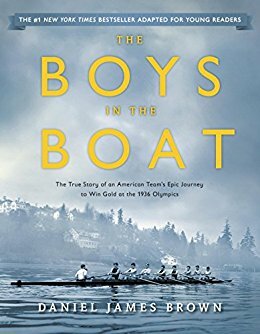 I enjoyed this book so much that I actually watched rowing during the 2016 summer Olympics. Who knew there were so many different rowing categories for heats. Oh, and you learn what heats means.